The best fillet knife is a good and sharp knife. That much is obvious. It should also be flexible with a handle that is easy to grip. Until recently I had a cheap fillet knife that was not of good quality. It came as part of a fishing set that I got on clearance at a store that was closing. The handle was made of cheap and brittle plastic. It also had a removable blade that when inserted into the handle would lock in place with a plastic screw. After use, the blade would become loose, and over time the screw would have to be tightened so much to keep the blade in place that it broke. The blade itself was not the issue, but the handle. When the screw in the handle broke, I set out to buy the best fillet knife I could find within a reasonable budget. I settled on a quality fillet knife made by Rapala ®. It is made by J. Marttiini ® of Finland. The best fillet knife I’ve ever owned has a stainless steel blade that is hand ground, and is super flexible. My fillet knife has a laser etched wooden handle and a brass-colored metal protector on the tang. It also came with a very nice leather sheath to protect prying hands from the dangers associated with carrying a knife around. The sheath has cutouts in a loop for carrying the knife on your belt. This knife is of decent quality, and should last a good, long time. I wouldn’t say a lifetime, because keeping a knife means sharpening. Sharpening a knife takes away from its material, and there is a finite amount of material on this thin blade. I imagine that it will last me 20 years or so, and that’s not bad at all. 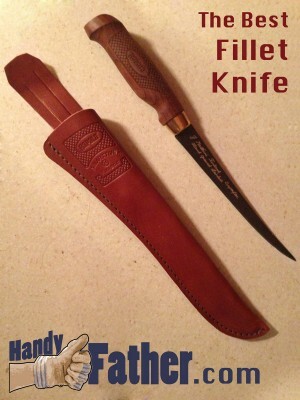 Click here to check out The Best Fillet Knife for you. Do you have a favorite fillet knife? Let me know in the comments below, or tweet @handyfather.